Russian companies have significantly increased exports of timber and wood products. This was fuelled by the growing demand from Asian markets, the devaluation of the ruble, as well as the diversion of a large part of Canadian supplies to meet increasing US demand. 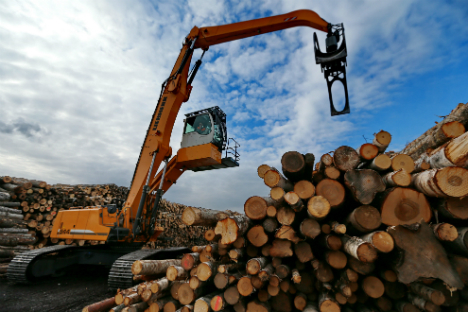 The volume of Russian timber exports grew by 7.9 percent in 2014, making the timber industry one of the best performers in the country's external trade, according to a report prepared by the Lesprom Network Analytic Agency. China, the largest importer of Russian timber, increased the volume of orders in 2014 by 17.6 percent to 9.24 million tons. Currently, Russia is China's second largest supplier of timber after New Zealand and in 2015 may overtake the Pacific nation. Moreover, accessible prices help Russian production stay ahead of the competitors in European and US markets. Lesprom Network Chief Executive Alexei Bogatyrev believes that New Zealand is constrained by a government lobby against timber exports. The devaluation of the ruble gave Russian companies an additional lever in negotiations with competitors on the global market, says Sales and Marketing Director of the Arkhangelsky Pulp Mill Alexei Dyachenko. “Even with a decrease in dollar prices, currency earnings will grow in translation into rubles,” he says. The fall of the ruble against the main world currencies in the end of 2014 stirred a demand for Russian plywood, whose prices fell by 40 percent from September 2014 to February 2015, says the Lesprom Network report. In early 2000s, Russia was the leading timber importer to China, providing over 20 million tons, according to International Trade Center data. However, since 2007, the number of orders decreased to 9 million tons, and in 2013 the Russia ceded first place to New Zealand. Nevertheless, the decline of the ruble can also become a reason for an increase in costs for the business. “Russia imports most of the technological and auxiliary equipment and the devaluation of the ruble in this case leads to an increase in the payback period,” explains Boris Kaznacheev, Deputy General Director of the Russia-Chinese RosKitInvest Company. Russia's main suppliers for the Asian markets of China, Japan and the South Korea are the regional producers located in Siberia and the Far East. Russia's interest is stimulated by the Asian partners' multimillion-dollar investment proposals. The largest example of Russian-Chinese cooperation today is the construction of the Asinovsky timber industrial park in the Tomsk Region with an annual timber procurement and processing volume of 4.5 million cubic meters. The main investor is China’s AVIC International, which manages the project through its Russian branches, RosKitInvest and Khenda-Siberia. “The total investment volume from China may reach 80 billion rubles ($1.57 billion),” says Boris Kaznacheev from RosKitInvest. The first plant producing veneer started operating in February 2015. Its supplies head for China, Japan and South Korea. According to Kaznacheev, the plant will break even in five to eight years, depending on the value of the ruble. Substantial volumes of the production are headed for China. The Japanese and Korean markets are still difficult for Russian producers since they lack strong growth prospects. “The plants that supply Japan are those that were initially built according to Japanese standards,” explains Bogatyrev. He believes an increase in demand in the near future is not predicted for the Japanese and Korean markets. However, Russia's cooperation with China may open doors to other Asian markets. The Chinese Timber Industry Association prepared a project for the creation of an international center of timber trade in the northeastern part of the country, in the town of Hunchun. The Xinhua News Agency said that the center “as a transit hub will stimulate timber trade with Northeastern Asia, especially trade with Russia." With Russian enterprises focusing more on China in 2014, supplies of Russian timber were reduced to the leading European importers: by 2.3 percent to Finland (to 4.47 million tons) and by 5.6 percent to Sweden (to 664,000 tons). However, the increase of supplies to China is due to the growth of its economy and there is still no talk of the redistribution of export. A focus on European markets is caused by the geographical proximity of some regional industries in Russia. "Arkhangelsk PPM does not intend to re-orient the main export destinations in Asia because of the expensive logistics,” says Alexey Dyachenko. “In the long term it is unlikely that Russia will make an unequivocal decision towards China," Bogatyrev says. He believes that Russian timber exporters should not focus solely on the Chinese market. Trading with both Europe and China would be the effective solution, in his opinion.